When mid-size truck sales all but dried up a few years back, most left it for dead, but with gas prices low, it seems that Bay Area buyers have rediscovered its advantages over full-size models. The Tacoma has been one of the few trucks that not only survived the downturn in sales but actually flourished. 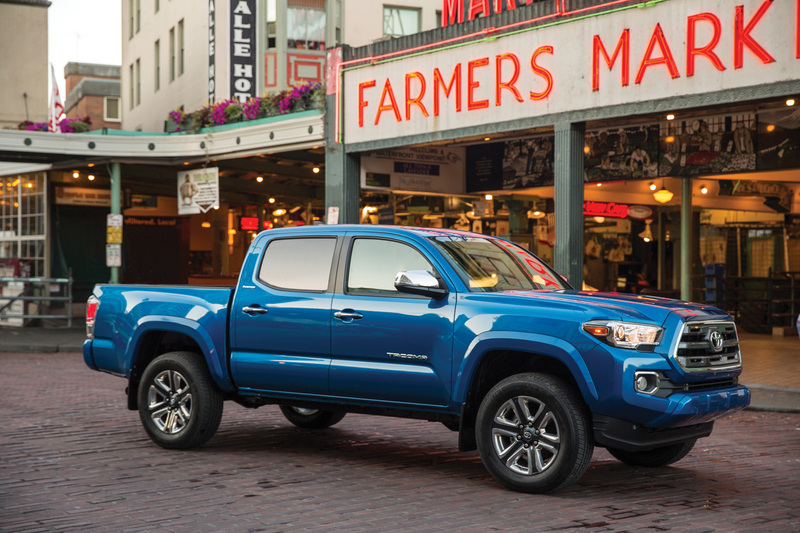 The 2016 Tacoma is all-new from the ground up starting with a larger, taller grille and headlights that are much smaller in size and positioned at the top of the fenders. You’ll also notice more modern taillights and a lockable tailgate. 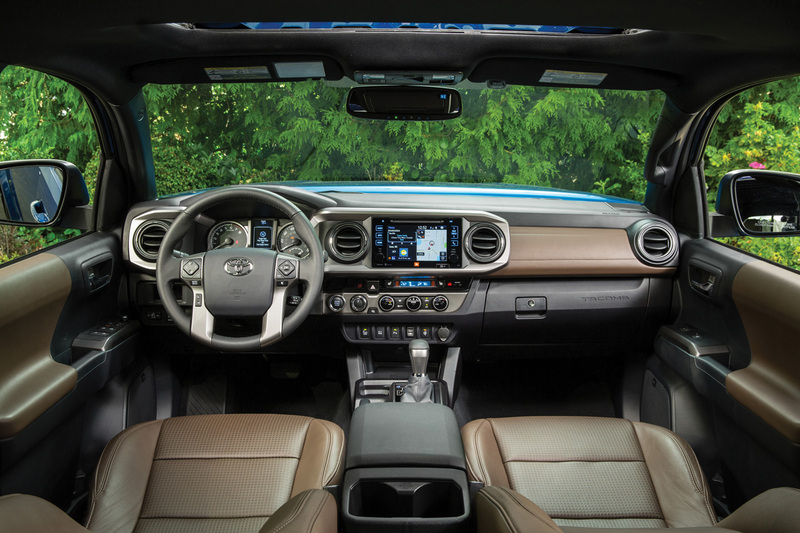 Interior of the 2016 Tacoma. This new Tacoma features an interior that exudes a real sport truck feel. A large, mid-dash rectangular pod contains an easy-to-use touch screen with radio controls. Below it are the climate controls. There are two engines available; a 4-cylinder with 159 horsepower and a 3.5-liter V-6 with 278-horses. Both get similar mileage; 19-city and 24-highway when mated to the 6-speed automatic transmission. Get the V-6, it’s a perfect match. On-road ride quality improves and so does off-road ability when equipped with the TRD off-road package. You’ll also find a much quieter cabin than before thanks to an acoustic windshield and more sound deadening materials. Other trim levels include the base SR, SR5, TRD Sport and Limited. All-new last year are the twin, mid-size entries from General Motors, the GMC Canyon and Chevy Colorado. These trucks are identical under the skin. Brand specific wheels, front and rear fascias and some interior bits define the two models. 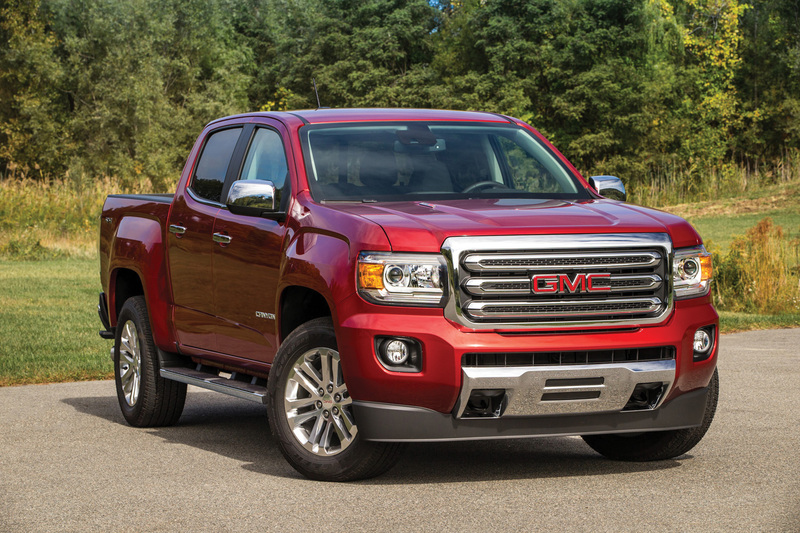 The GMC boasts a more aggressive grille opening with high mounted, projector-beam headlamps. Wheel well openings are carved into big-shouldered fender flares. The rear tailgate features a torsion bar enhancement to help ease it open and close. Comfort is enhanced with technologies, connectivity and other features that support owners’ daily and recreational lives, including a 3.5-inch-diagonal driver information screen in the instrument cluster. The big news for 2016 is the available 2.8-liter, 4-cylinder, Duramax Diesel engine that generates 181-horsepower and 369-lb.-ft. of torque, giving the Canyon enough grunt to tow 7,700 pounds – 700 more than the gasoline V-6. There are 3 trim levels available; the base, SLE and SLT in either 2-wheel or 4-wheel drive. Choose from extended or crew cab and short or long bed. Pricing starts at $20,955 for the extended cab model.